Former Liberal MP Borys Wrzesnevskyj's court case over alleged voting irregularities in his Etobicoke Centre riding could raise larger questions about the integrity of Canada's legal system. Can Canada's electoral system, held up as a model of fairness and integrity in developing countries, be rigged? That's a question that may come up when former Liberal MP Borys Wrzesnevskyj goes to court Monday to seek to have the federal election result overturned in the Toronto area riding of Etobicoke Centre, on the grounds that there may have been voting irregularities or fraudulent or corrupt illegal practices. 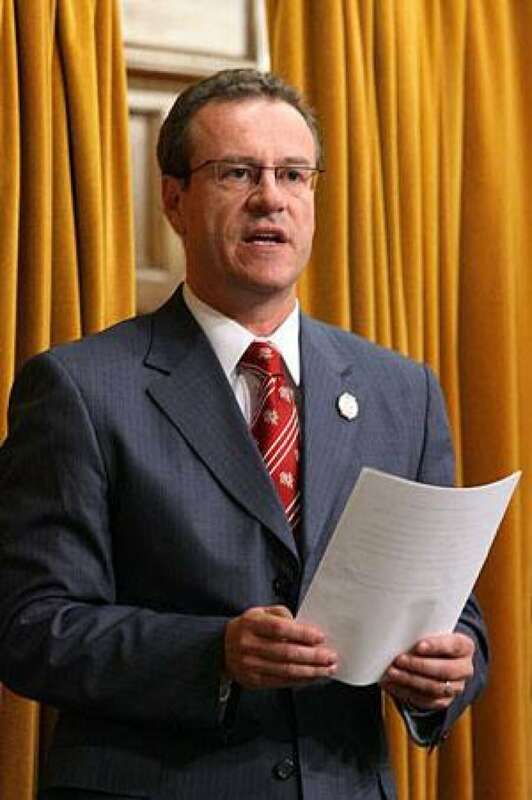 A three-time MP, Wrzesnevskyj lost to Conservative MP Ted Opitz on May 2 last year. Wrzesnevskyj's case aims to show that in Etobicoke Centre, dozens and dozens of people voted without providing any evidence showing where they lived. The case alleges dozens more registered to vote on Election Day in one part of the riding, but were on the voters’ list in another part of the riding — and that at least five people appear to have voted twice. In all, 181 votes are being disputed. Borys Wrzesnevskyj lost Etobicoke Centre by just 26 votes in a riding where over 50,000 people cast their ballots. Wrzesnevskyj isn't alleging that fraud necessarily took place. But he’s trying to prove there were enough "irregularities" so that at least 26 votes, or more, should be discounted, triggering a byelection. Conservative MP Ted Opitz is countering that clerical errors are made in all elections, and that just because documentation can't be found for some voters doesn't mean it doesn't exist. His defence goes on to say that, "If every mistake or error is an 'irregularity' then the results of numerous elections will be open to challenge." The judge does not have to find that fraud took place, but will be asked to rule about whether there are enough questions about the Etobicoke Centre vote to warrant a do-over. But the case raises questions about how susceptible the electoral system is to errors or even vote fraud. One returning officer in another riding, who didn't want his name used, said Canada's electoral system is fair, but is open to abuse. "To a certain extent it's an honour system," he told CBC News. "If someone was really, really determined they could probably vote two or three times." For instance, he pointed out, if the system shows that someone has already voted in an advance poll, and they show up on Election Day claiming that their name was crossed off the electors’ list accidentally, they can be sworn in and permitted to vote, possibly for the second time. He added that if people were cheating in large numbers it would be noticed. But fraud on a small scale, even a minuscule scale, happens — and Elections Canada knows it. Between 1979 and 2006, Elections Canada recorded a handful of convictions for voter fraud: one conviction for impersonating another voter; four for voting when unqualified; and five for voting twice. After the 2000 election, Elections Canada examined a sample of 786 poll books (a record of what happens on Election Day) and found 27 instances where voters claimed that they either were mistakenly marked as someone who’d already voted, or someone voted in their name. These few instances of possible voter fraud were one reason why the voting rules changed in 2006 so that even people with voter identification cards who are on the electors’ list must show proper ID at the poll. Andre Turcotte of Carleton University, who has studied voter manipulation, says that stuffing ballot boxes can work when it's tied to turnout. "If you had an electorate that voted in the regular 80 per cent, when we used to have 75 to 80 per cent turnout, targeting specific voters, it's probably impossible ... to make a difference at the ballot box. "But if you start looking at 50 per cent turnout, close races, then the numbers you need to move to make a difference are more in reach of an organization." Elections Canada has to deal with the impossible-to-failsafe task of hiring 200,000 people to undergo some training and then work one extremely long Election Day. It's a balancing act to prevent election fraud and at the same time carry out what Elections Canada sees as its prime objective: ensure that every Canadian who is eligible is able to exercise what is a constitutional right. But, in some circumstances, given the frailties of 200,000 temporary workers and the will to attempt to manipulate the vote, adding voters is not inconceivable. Hope for incompetent officials who allow you to register without proper ID, who don't check the address you give, who allow someone to vouch for multiple voters. Scatter your attempts across a number of polls. The worst that can happen is that you’ll be turned away. The best: you may be able to vote twice, and in nail-biter elections, every vote counts.